Ideal if: you have skin concerns and want long term, proven results. Focusing on the use of the freshest and most active forms of vitamins A (Retinol) and C, plus additional growth factors, these treatments are designed to offer maximum results. The latest methods of enhanced penetration disperse the active molecules into the deeper layers of skin where they work to hydrate; stimulate collagen production; reduce pigmentation and scarring; and normalise skin cells. Treatments are tailored to specific skin type and condition. These advanced treatments are particularly suitable for those wanting faster results on problems skins, including photo-damaged (wrinkles), mature, pigmented and scarring. This Skin Treatment is one of a kind in Kent, we are the only salon to have both the CACI Ultra and the Environ Ionzyme machine, simply because we want to give our clients the very best results. Combing the Environ Vitamin Treatment including the Environ mask with the CACI Non-surgical Facelift. This is the ultimate anti-ageing treatment to give the skin a super lift. The CACI Non-Surgical Facelift uses electrical current to stimulate, tone and strengths the muscles of the face whilst the Environ Ionzyme machine using sound waves and electrical current to force active ingredients deep into the layers of the skin. Great for a special occasion or for lasting results a course of treatments is recommended. “Received a fantastic facial from Addie, she is very professional and an excellent therapist, I would highly recommend her to anyone. I have been going to the salon for 5 years now and I had Addie by chance as my usual therapist was off sick.I left feeling invigatorated. This revolutionary approach to peeling achieves incredible results without damaging the skin. Low strength Lactic Acid is used to reduce the skin’s PH and trigger the release of growth factors, which creates tighter, smoother skin. It destroys bacteria, boosts hydration and removes the build-up of dead skin cells, helping to decongest the surface and smooth its texture. The Cool Peel is ideal for clients with lines and wrinkles, rough or problem skin, sun damage and Rosacea. The Environ Intense C Peel specifically targets pigmentation and uneven skin tone or skin that needs to be brightened. It is also recommended for photo ageing and lines and wrinkles. The Intense C Peel solution is fortified with extra strength vitamin C which lightens and brightens skin tone and brings anti ageing benefits. Used with the Ionzyme DF Machine the solution is applied to the skin and pulsed iontophoresis and sonophoresis is used to enhance the penetration of the ingredients deep into the dermal layers of the skin. The 4000% increase in penetration of ingredients brings visible results to the skin. The ingredients are left on the skin after the facial as absorption process continues for an hour after the facial. Your skin will look luminous and bright after the facial. A course of weekly treatments are recommended to give the best results. Using the NEW Environ SONO DPF 312 serum, we have now introduced a new Collagen boosting facial which will assist in creating an overall improved skin appearance, softening fine lines, tightening lax skin and refining the appearance of scarring and uneven skin texture. The product is excellent for improving skin tone, elasticity and overall appearance of skin. It will also help the stimulation of hyaluronic acid and therefore improve skin hydration. Created to purify, micro-exfoliate and re-hydrate your skin, this particular treatment assists with the treatment of acne, scarring and deep skin congestion. The combination of scientifically advanced products and techniques revives and refreshes your skin, leaving your skin like new. This traditional manual facial is perfect as an introduction to the Environ Facial range. Gentle exfoliation, steam & extraction, massage and mask are all incorporated for maximum results and enhanced relaxation. The freshest, most active forms of Vitamin A, C and Anti-Oxidants are driven deep into the lower layers of the skin using soundwaves and small electrical pulses. This scientific approach stimulates Collagen to soften lines and improve elasticity, increase hydration and boost radiance. 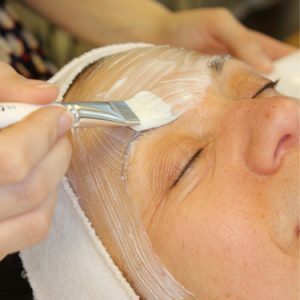 This treatment is suitable for all skin types and is particularly effective at addressing sun-damage, pigmentation, premature ageing, dryness, uneven skin tone and scarring with measurable differences after just one session. Has your lifestyle left you with skin that is showing more wear and tear than you care for? By treating the skin with the Lac Pam Gel peeling system we can start to reverse the environmental damage on your skin and repair cellular damage. This hydrating treatment will leave your skin looking younger. Suitable for all skin types including darker skins, pigmented, dry and dehydrated skin types. This facial combines the instant skin smoothing benefits of Diamond Peel Microdermabrasion with the skin nurturing & strengthening properties of the Environ Gold Vitamin Treatment. This treatment has been specifically designed to reduce the depth of wrinkles caused during facial expression, especially in the forehead and around the eyes. The cocktail of active ingredients attack the process of wrinkle formation in three different but complimentary ways. Muscles are less responsive to nerve impulses thereby softening muscle movement. It is a safer, non-invasive, mild alternative to wrinkle relaxing injections. Many people have seen visible results within one to two hours of treatment. This super hydrating treatment bathes your skin in moisture as well as delivering the all important skin nurturing vitamins. Skin is cleansed and steamed, followed by the Ultrasonic Peeling system. which uses a hand piece containing ceramic/quartz heads that when excited by an electrical current emit piezoelectric vibrations that cause the hand piece to vibrate at 27,000 vibrations per second on the skin surface. These rapid vibrations push skin impurities to the skin surface and cause any dead skin cells to become dislodged . The vibrating hand piece is then used to deep cleanse and gently exfoliate the epidermis. Treatment is concluded with the application of a skin normalising moisturiser. This deep skin cleanse is ideal in between regular facials if you have lots of blackheads and blocked pores or if you are a teenager suffering from breakouts that often occur during puberty. During treatment your skin is gently exfoliated and steamed to soften and loosen comedones (blackheads) which are then gently eased out of the skin. Treatment is concluded with the application of a skin normalising moisturiser. If you have not had a skin specific facial with us before please book a complimentary pre facial consultation (extra 15 mins) at the same time as your choice of facial. If you’re not sure which of our facials would be suitable for you and would like more advice, either call reception or book a free skin analysis consultation (half hour appointment) and discuss your skin care concerns with your therapist.